I love Disney with all my heart. I did a college program there 2 years ago and worked on it's a small world and Peter Pan. I know the parks like the back of my hand. I though it may be good to do a post of tips for doing the parks up right. Saturday Jared and I met up with our old friend Beth to meet her fiance, Kiefer, and to take WDW by storm. 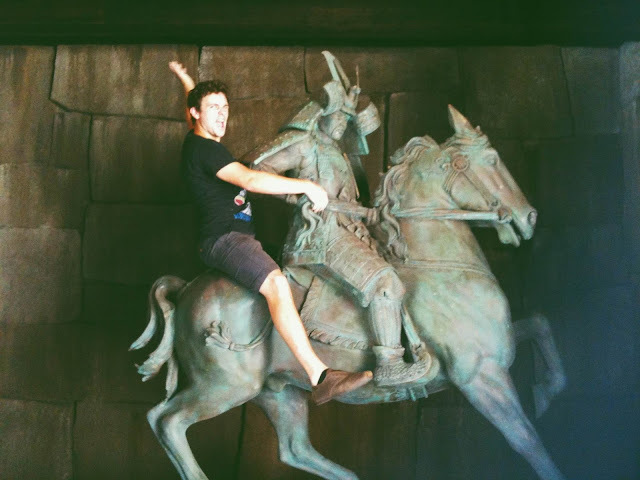 We had an excellent time!Jared was a crazed rule breaker and decided he should ride this horse in Japan. This is a key tip on what not to do, unless you are very nimble and very sneaky. Luckily the Bird is both. 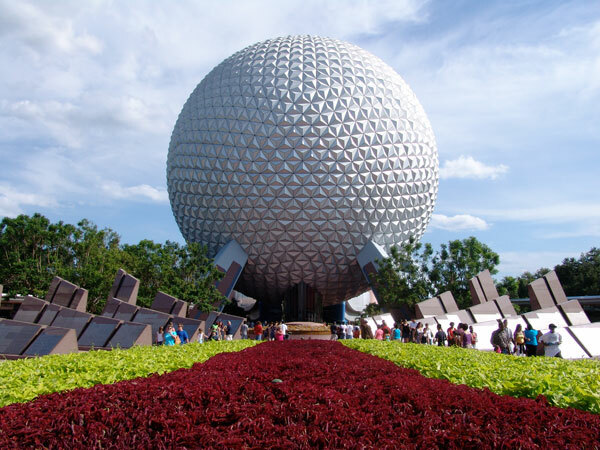 First things first, you walk into Epcot, and see the giant and iconic golf ball staring you in the face. You get stars, or golf balls rather, in your eyes and immediately make your way towards it, like a moth to the flame. Tip # 1, Skip the ball!! If you head into Disney during the summer, I guarantee that the first few hours the park is open, the line to this ride will be long. And I don't want that for you. Save your line waiting, believe me. Some people love this ride, and some people hate it. I am in the love camp. Think carousel of progress meets people mover meets Judy Dench. I promise that if you wait just a few hours, or even hit this sucker before you leave, you will walk right in, plop right down in your little cart, and be on your merry way. Trust. Tip # 2, Head to The Land Pavilion, or if you have kids, send one person to the pavilion with all the tickets while you head over to club cool so the kids don't squall even more when they realize they have to wait even longer to ride a real ride, and get Fast Passes for Soarin. If you do this first thing, your fast pass should be around noon or one which is not that long of a wait if you ask me. Now after you obtain the Fast Pass, you are free to do what you like, but I suggest hitting Club Cool, which opens at 10:30, to sample Coca Cola products from around the world (drink all the Mezzo Mix, trick someone into drinking Beverly because its nasty). Then go outside and either head to the character spot to take pics, you'll wait in way shorter lines then MK, or go right in front of the fountain to meet some bizzaro character, like Rafiki or Balloo. Tip # 3, Disney trains new character performers in EPCOT. You will often find unusual characters here. One spot is the giant fountain, as mentioned, the other is, as our walking from Britain to France, down to the left. You will see princesses and fur characters here so keep an eye out. Tip # 4, Always choose single riders on Test Track. Always. Tip # 5, The energy ride is pretty entertaining, but it is loooong. Like 20 min. If you're in the park all day I would definetly ride it, but if you're park hopping this probably isn't for you. Tip # 6, Captain EO is the best. Period. Could be a little scary for small children. Tip # 7, I hate Mission: Space. If you must go, there is never a wait and you will get nauseated. Cool! LOVED the tips on where to find unusual training characters! And I agree whole-heartedly about skipping the ball to run straight to the land for Soarin' fast passes. Best EPCOT tip ever! Loved your description of Spaceship Earth too: "Think carousel of progress meets people mover meets Judy Dench." Perfect.